Process the dry ingredients first, and then add the sticky and wet ingredients interspersed with pulsing your food processor. 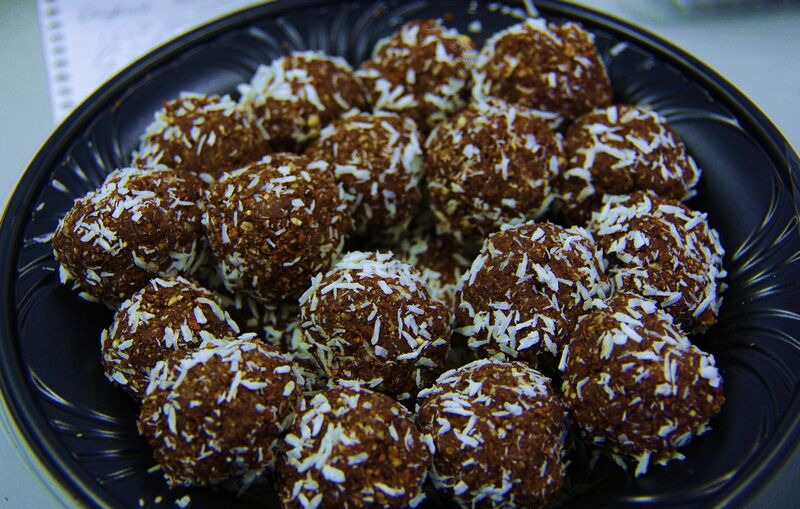 Roll into balls using dry ingredients to coat the outside, such as raw cacao powder, raw carob powder, cinnamon, rolled oat groats, dried coconut shreds or any other applicable spice. Another option is to press the entire mixture into a glass pan (the same sort you'd bake brownies in) and then slice into squares. Slicing into squares is a lot easier in my experience. Remove the hard stems from the figs. Juice the lemon with a lemon juicer or your hands onto the carrots. If using whole carrots then wash them, remove tops and chop them first. Add all dry ingredients to your food processor (chia seeds, dry nuts, cacao powder) and process until completely combined. Begin to add dried fruits, starting with the least sticky. This will depend on your individual dried fruits, but this order is likely to apply: figs, dried apricots, prunes, cherries, currants, dates. Add in the carrot bits along with the dried fruit. Add any nut butter last. Continue to process until fully combined. Spread raw cacao on a cutting board or on a large plate where you will roll the balls. 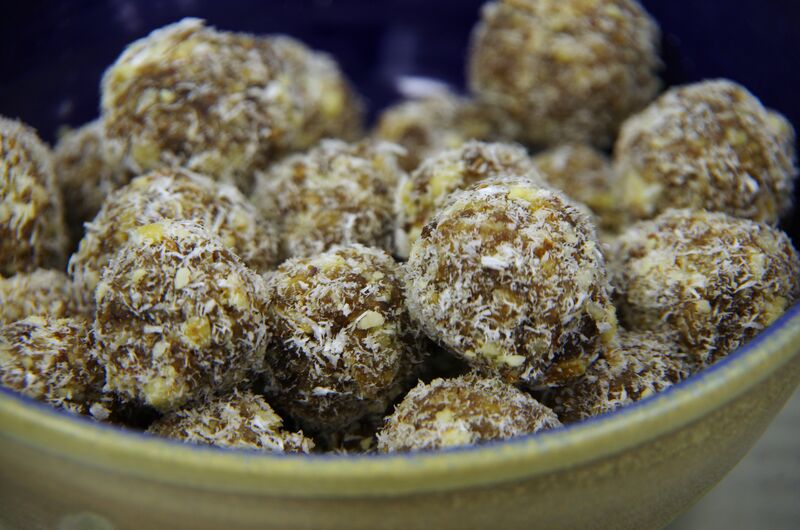 Form balls in your hands and roll them in the powder to create a dry exterior. Serve on a decorative plate and garnish with berries and herbs. This was my very first video demo and it was done before I got a pentax. It was recorded on a fuji with non-incredible performance. I didn't even consider what I was wearing... Live and learn. Recorded back in the summer of 2010. Photos taken by Raederle Phoenix and Lytenian in Buffalo, NY at Timon Towers and Aaron Fried's house in 2012. 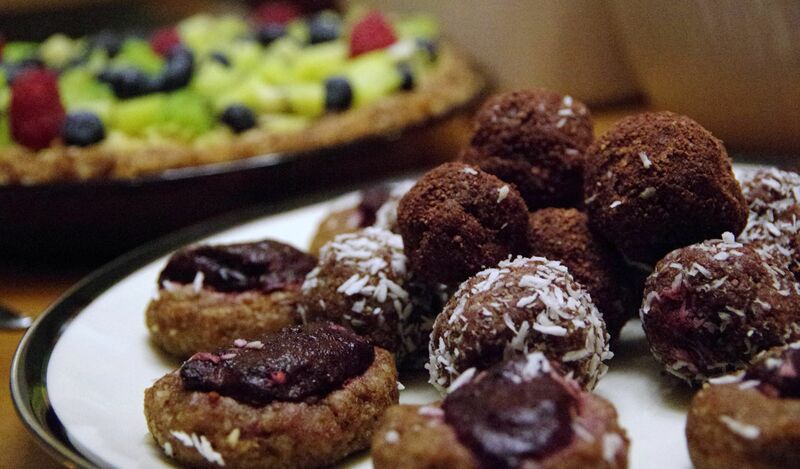 Enjoy your holidays with healthy treats.